Looks nice, I'd definetly roll it. DC, sell it like that for extra $5000, I am getting it. Isn't that the concept Patriot? I'd love to see that same 'option' as a checkbox on the order sheet. 30MPG + great looks! I don't think so, it's from SEMA. It's a concept from MOPAR's Skunkwerks division, notice the banner behind it. Saw my first Patriot on the road yesterday in Carmel, IN. I've never looked at them up close. They seem pretty small, like a miniature Cherokee Classic, but what do you expect for under $20K? 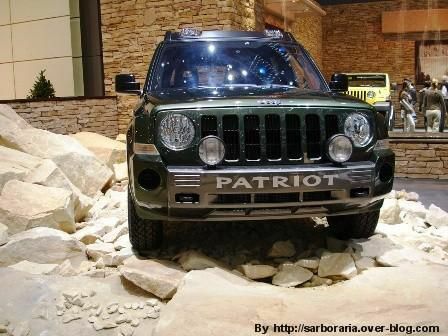 Off Road Adventures has an article on the Patriot this month. I think they're exagerrating a bit with all the comparisons to the XJ. If my Liberty wasn't all paid off, I'd be trading it in on a FDII Patriot today just for the gas mileage increase I'd get in return. Donnie - thanks for the pic! Is that where gas tank is gonna be? if so why they moved the KK's tank and slapped the spare there? I guess it had nothing to do with the federal regulations? and hauling a lot of stuff on vacation steered us to the 4 door Wrangler. heck yes... DC needs to release this to dealer showrooms. And someone needs to do it to the Compass also..
My g/f wants a compass, I didn't like it til we drove it..
Comfy and roomy inside.. love those reclining rear seats..
Peppy little engine.. in a 6 speed..
She drove a limited version, black and silver.. the little bugger is growing on me.. as well as the patriot. 2005 Liberty Renegade (stock) for now !! Wish list: 2.5 inch lift, bigger tires and more aggressive tires. Custom rock sliders. That's it for now. Does anyone know if that roof rack with the built in lights is available to buy?